Witnessed shredding is the ability to observe the shredding process. 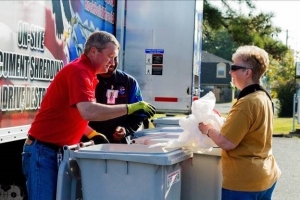 It’s usually associated with mobile shredding services, but can also be available at shredding plants, independent shredding companies, and even some drop off locations. There are several ways that you can actually witness your shredding project, from a closed-circuit TV at a shredding plant to a mobile shredding truck shredding your files in your parking lot while you watch. By witnessing your shredding, you can have the peace of mind that your personal or company documents are destroyed while you watch. It also helps to ensure the chain of custody for your files remain intact until you receive a certificate of destruction. Get Free Quotes on Witnessed Shredding Services Near You! Shred Nations can help you find the shredding providers and services that let you watch your documents be shredded. Our experts will guide you through the process from choosing the service to finding the contractor to match your needs and budget. To get started with a free quote today, fill out the form to the right, or give us a call at (800) 747-3365. Within minutes of receiving your request, you will be contacted with shredding quotes from experts in your area that can help you.